Hagerstown Canteen Service in Waynesboro does vending machines, office coffee and water filtration for businesses in your area. Our services eliminate wasted time. They stop your employees from leaving to seek out coffee, a cold beverage or a snack to stay refreshed and focused. We bring those items right to the office, often at better prices that what they normal can get. We are a full service vending provider, and offer name brand vended products for you to choose from. 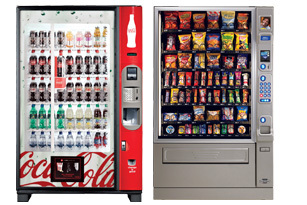 Our vending options include traditional vending, subsidized vending and free vending. You may also choose to have a Micro Market at your Waynesboro location. Our Micro Markets have a self checkout kiosk and can provide much more for your hungry and thirsty employees. Enjoy a fresh, crisp, clear cup of drinking water with our filtered water service. It is plumbed in, so you'll never have a shortage of hot or cold filtered water. You'll notice the difference in your coffee and tea too! Phone us at (301) 223-8000 or info@hagerstowncanteen.com. You and your employees are guaranteed to love the results.